Many drive systems demand that electric motors are able to operate on a frequency inverter. At a frequency close to zero, the standard ventilation of an electric motor is insufficient, thus, the electric motors have to be force cooled by way of an external cooling system. Here we offer our external forced ventilation units from frame size 56 up to 560. This forced ventilation unit consists of a axial driven fan which is integrated in a fan cowl for protection against damage. 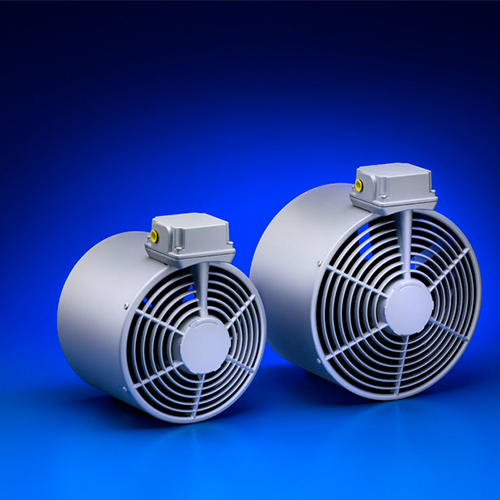 In addition to our standard series which are available from existing stocks we supply also forced ventilation units customized to be assembled on all available OEM-motors. The forced ventilation units are designed for the cooling of electric motors driven by a frequency inverter in duty S1 up to S9. These forced ventilation units are used for example in plant construction and mechanical engineering, in the field of hoisting, winding and in the pump industry etc.